Bezique (French: ) or Bésigue (French: ) is a 19th-century French melding and trick-taking card game for two players. The game is derived from Piquet, possibly via Marriage (Sixty-six) and Briscan, with additional scoring features, notably the peculiar liaison of the Q♠ and J♦ that is also a feature of Pinochle, Binokel, and similarly named games that vary by country. Bezique was developed in France from the game Piquet, although the word Bezique, formerly Bésique or Bésigue, was known in France in the 17th century, coming probably from the Italian card game Bazzica. The word bezique once meant "correspondence" or "association". In English-speaking nations, Binocles, meaning eyeglasses with this pronunciation, became the name for Bezique with minor rule variations, ultimately evolving into Pinochle. Two-handed Pinochle and two-handed Bezique are almost identical. The former, together with Six-Pack Bezique and Rubicon Bezique, is still played in the United States of America. The game achieved its greatest popularity in Paris by 1860 and in England a few years later. Perhaps the most famous proponent of the game was Winston Churchill, an avid player and early expert of Six-Pack, or "Chinese" Bezique. There is some evidence that the English writers Wilkie Collins and Christina Rossetti were also enthusiasts. However, since the late nineteenth century the game has declined in popularity. A two-handed Bezique deck is a 64-card deck, consisting of Ace through 7 of each suit doubled (i.e. 2, 3, 4, 5 and 6 are stripped from two decks and the remaining cards combined.) The players cut for deal, with the highest card having preference. The rank of the cards in cutting, and in play, is A, 10, K, Q, J, 9, 8 and 7. Eight cards are dealt in batches of 3-2-3, to each player with the next card being placed face up between the two players to establish the trump suit. The remaining cards, known as the "talon" or "stock", are placed face down beside it. Should the turn-up card be a 7 the dealer scores ten. The non-dealer leads any card from hand and the dealer may then play any card. The normal requirement to follow suit if possible does not apply to Bezique. If a second player chooses to play a higher card of the same suit or any trump, that player wins the trick. If the two cards of the same rank are played, the trick belongs to the first player. Once played, tricks are placed face down by the player who wins each trick. The holder of the trump 7 is entitled to exchange it for the turn-up card at any time when on lead, scoring 10. The holder of the duplicate trump 7 also scores 10 when it is played. The winner of each trick declares one meld face up on the table and scores points for it, takes a card from the top of the stock and then leads to the next trick. The other player draws the second card from the stock but may not declare a meld. The game proceeds until the stock is exhausted, at which point 8 more tricks are played to exhaust the players' hands. Finally, brisques are scored. The game is usually played as first to 1000 points. A Bezique may be Q♣ J♥ instead if either spades or diamonds is the trump suit. In some variants, four-of-a-kind melds must contain a card of the rank from each suit, e.g., K♠ K♥ K♣ K♦. In order to score for a meld, the cards comprising the given combination must all be in hand at the same time; thus cards played to previous tricks may not be included in melds. However, cards already declared may be used for other melds of a different type as long as the point score is greater, for example four kings may be declared using a king previously declared for a marriage. A marriage can not be later declared using a king previously declared in a meld of four kings as the point score is less. A card played to a trick is no longer available for game play. It is taken by the winner of the trick and placed face down on a separate pile. At the game's conclusion, each player counts the number of brisques (aces and tens) they have won in tricks. Each is worth ten points. A player can declare a meld only after winning a trick. The winner of each trick is entitled to score one meld, or several melds, depending on local rules, laying the cards forming it face upwards on the table. If the cards exposed show two combinations, both may be declared but only one may be scored until another trick is won. Thus, having K♠, Q♠ and J♦, scores 40 for Bezique with more 20 to score after the next trick is won. Once a card has been melded it cannot be used again in the same combination, but it may be used for a different type of meld, i.e., the Q♥, once married, cannot be married to the other K♥, but it may be used as part of four queens and as part of a sequence if it is of the trump suit. Also a card which has been declared may not be declared again in a combination of an inferior order, i.e., if a king and queen have been declared as part of a sequence, they may not be used subsequently in a marriage, though the reverse is allowable. The declared cards, left face upwards on the table, still form part of the hand, and are played to subsequent tricks at the discretion of the holder. When no more cards are left in the stock, the method of play alters. No further declarations may be made and the only additional score now possible is for brisques in the remaining tricks, scored by the winner of the trick. The mode of play for these last eight tricks is according to normal Whist rules in that each player must now follow suit if possible, with the additional constraint that they must win the trick if possible, by playing a higher card or by ruffing. Bezique is not generally perceived to be a difficult game, though remembering the possible meld combinations and scoring can be confusing for the complete novice. There are also a number of small rules, such as the high ranking of cards with a face value of ten, the ability to swap sevens with the trump card and so on, that beginners should keep in mind. Once the general pattern of playing a trick, declaring a meld (if any) and then drawing a new card from the talon is established in the mind, the player should then focus on tactics. Required are two packs of cards and a sheet of paper and pen to collate scores. Special Bezique markers were made at the height of the game's popularity but mostly these are rare now. Take the packs of cards and remove all cards with a value below seven, along with the jokers or wildcards. Remaining should be the cards with the numerical values of seven through to ten, the face cards and the aces. Shuffle the two packs together. A cut is made. The player with the highest valued card is given the privilege of dealing. The remaining cards are placed in a stack or talon in the middle of the table. One card from the talon is turned over and placed face up. This card designates what the trump suit will be. If the dealer turns over the seven as the trump card, he is awarded ten points. 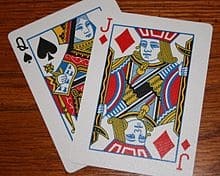 In a variation of the game, if a player finds he has no face card in his hand (A, 10, K, Q or J), he or she can declare "carte blanche" and receive 50 points from the opponent. All cards must be shown to the opponent to claim these points. This is not a standard rule of two-player Bezique but is allowed in some regions. The non-dealer may lead any card. This card is placed face upwards on the table The dealer must respond by playing a card. If it is a card of the same suit but has a higher value or any card of the trump suit and the leading card is not of the trump suit, it wins the trick. If it is a lower or equal card of the same suit or a card of any other suit bar the trump suit, it loses. Whoever wins the trick takes the cards and places them in a separate pile. These cards play no further part in the round. They are only used for counting brisques at the very end of the round. Note that there is no obligation to follow suit or to trump in this part of the game. The only time a player would have a strong motivation to win the trick is when there are aces or tens being played or the player has a meld they wish to declare. The winner of the trick has an opportunity to present a meld by declaring his combination and placing them face upwards on the table. They are still part of his hand but must remain on the table in view of the opponent until played in later tricks. Only one meld can be declared per trick won. Scores for these are written immediately. The list of melds and their scores are listed in the table above. Note that a card used in one meld cannot be played in the same meld later on. For example, a king of clubs married to a queen of clubs cannot later be married to the second queen of clubs. However, it can be used for a sequence of four kings as this is a different meld. Were both the other king and queen of clubs to be presented, the first king and queen could be part of the marriage. A special meld declaration involves the seven of trumps. It is not placed on the table with the others. Instead, it can be swapped for the upturned trump card. The second seven of trumps can also be declared in this way. The winner of the trick draws from the talon once they have declared their meld. The loser then also draws a card from the talon, thus maintaining eight cards in their hand at all times at this stage of the game. If no melds are declared by the winner of the trick, the cards are drawn immediately. Whoever wins the trick then leads first in playing the next trick. Once the talon is exhausted, the game play changes somewhat in nature. a.) From now on, the player must follow suit and play a higher card than the leader if they can. If they cannot follow suit, they must trump to win the trick. If they cannot follow suit or trump, they can only then play any other card. b.) Melds cannot be declared in this part of the game. c.) The winner of the final trick is granted ten bonus points. After the last trick is played, each player gathers the cards they have won and counts the number of aces and tens. Each of these is worth ten points. This number is added to the total score already earned from the various melds the player has declared. Traditionally, the first player to reach 1000 points wins, which normally involves an average of three to four rounds being played. However, a different target figure may be agreed upon before play begins, such as the first person to reach 2000 points. A player holding more than eight cards awards 100 points to their opponent. A player not drawing a card after a trick in phase one awards 10 points to their opponent. A player not winning a trick or following suit where it was possible in phase two concedes all remaining brisques to their opponent.